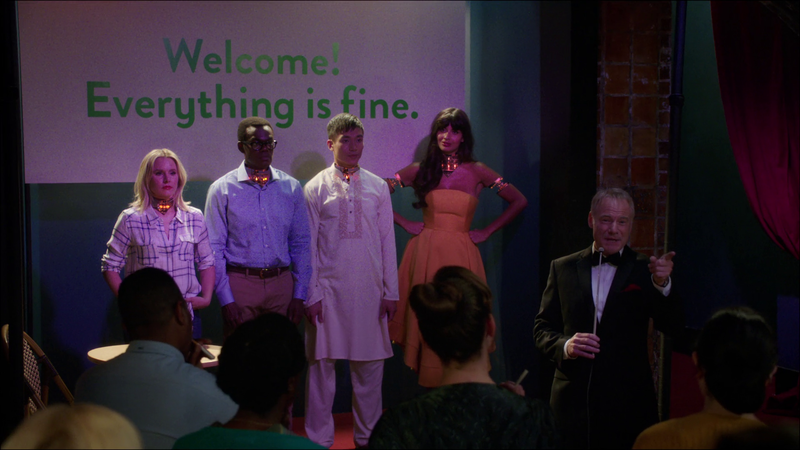 It's not much, maybe 30 seconds to a minute, but in the latest episode of The Good Place there is a bit with two fembots/animatronic beings. The episode is titled Rhonda, Diana, Jake, and Trent. The group is in the bad place as they call it and more specifically a museum. There are displays of first time things like the first time someone take a vacation from vacation and that kind of thing. There are like animatronic displays for each one. Anyway, towards the end of the show, there are ones made of the main group including Kristen Bell. Its nothing super great but a little nugget at least. They do have exposed parts around their neck and kind of have the look down at least. I've always imagined Kristen Bell as an android. Her face is a little too perfect. I have to say, Animatronic Tahani gives me the feels.